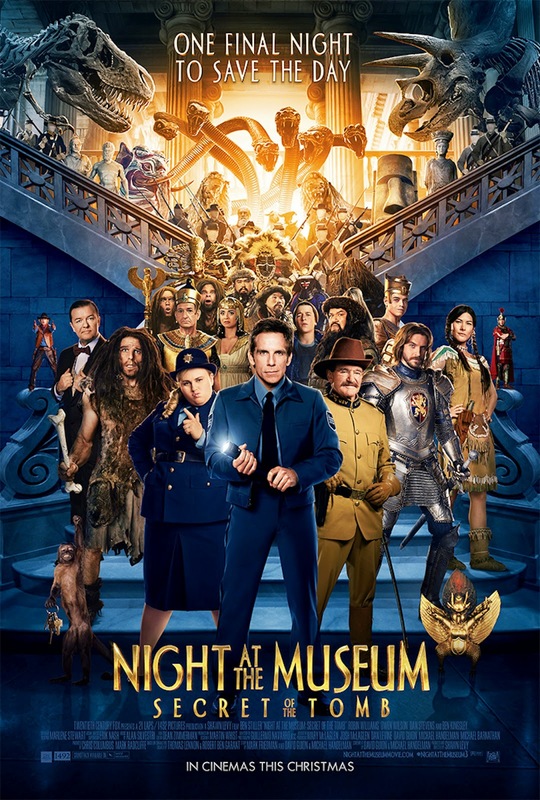 It’s been five years since the release of Night of the Museum 2: Battle of Smithsonian and the fans are probably excited about this sequel and last film, but sorry to say that Secret of the Tomb is nothing more than a quick cash-in that’s really short of genuinely funny moments with way too little activities and happenings for a supposed adventure comedy. I didn’t bother watching the second instalment but I strongly believe it’s safe to say that this one’s not the best in the trilogy. Directed by Shawn Levy, who did the all three of the films, the story reveals the origins of the magical Tablet of Ahkmenrah (which brings the museum exhibits to life) and that “the end will come” when it “dies”. 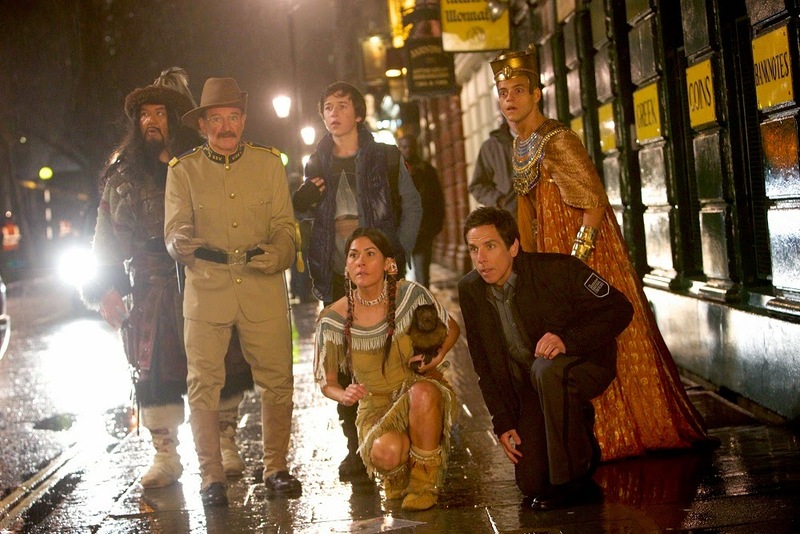 Larry (Ben Stiller) must travel to the British Museum with the dying Tablet to seek for a solution from Ahkmenrah’s (Rami Malek) parents (Ben Kingsley as Merenkanre). The ones that comes along with him are Theodore Roosevelt (Robin Williams), Jedadiah (Owen Wilson), Octavius (Steve Coogan), Attila the Hun (Patrick Gallagher), Sacagawea (Mizuo Peck), a new Neanderthal named Laa who looks like Larry (Ben Stiller too), Dexter the Capuchin Monkey and Larry’s son Nicky (Skyler Gisondo) who intends skip college and go to Ibiza to be a DJ. The visual effects are good and the humour isn’t too lousy but the film just feels too short. The characters encounter not enough obstacles and explore too little. There’s really nothing much that’s new or inspiring. The least the director could’ve done is excite the audience with the proceedings, but he fails on that as well. Where’s the creativity? Or was it budget constraint, perhaps? While it’s fun to see all these hilarious actors together again, nobody really stands out and the only memorable moments are Robin William’s (as President Theodore Roosevelt) final scenes and the surprise cameo appearance by Hugh Jackman as himself. 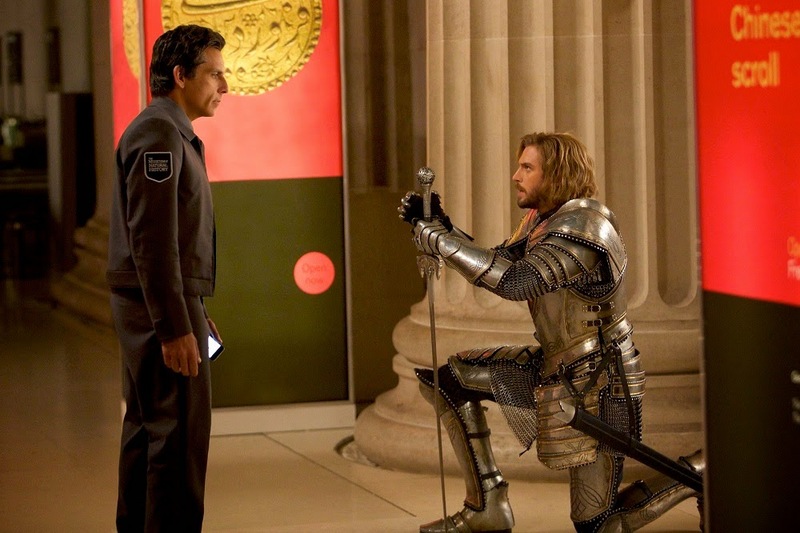 In the whole of the British Museum, Sir Lancelot (Dan Stevens) is sadly the only British character that’s introduced in the film. 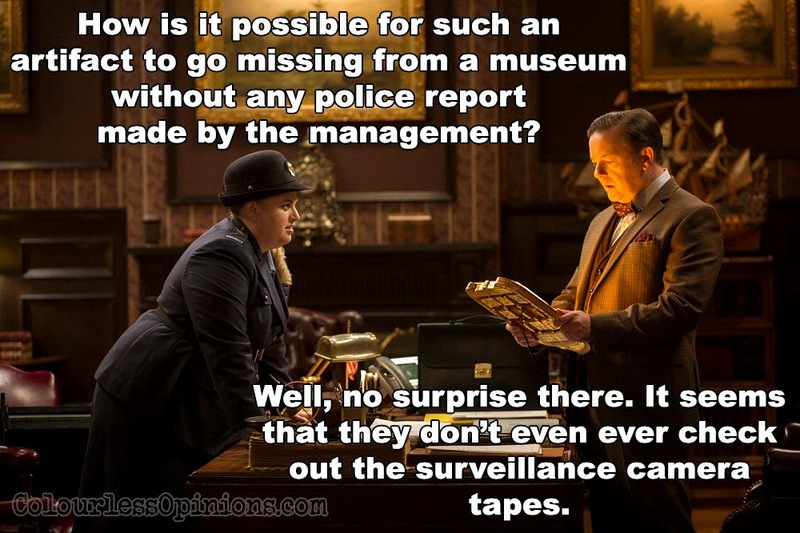 Exactly, where the hell are all the other more interesting iconic historical figures in museum? It’s a complete waste of the British setting. And how is the memory of each exhibit determined? Lancelot doesn’t seem to know that King Arthur and Queen Guinevere are dead. There are inconsistencies and other question marks as well, like how come some of the characters, like Laaaa and Atthila, can only speak their respective languages while others, like Akhmenrah and his parents, can speak in English? And as dramatic as “the end will come” is implied, the great big “Secret of the Tomb” solution to save and fully restore the Tablet is simply get it under the moonlight for a couple of seconds. How underwhelming! While the subplot between him and his son Nicky is a good message, it doesn’t quite convey why parents should agree with, and finance, their kids who wish to just on a year-long trip away after high school to attempt to be something they’re not even that passionate about, which for Nicky’s case, just sounds like an excuse to party and get laid until he feels its time to go to college. Also, the film backs the idea of not having a plan is a good thing, which I cannot fully agree with, not in this way at least. Good luck to parents who’re watching this film with their kids as they might use this to convince you to allow them to do the same. Malaysia censorship: Nothing seems to be cut at the press screening held by 20th Century Fox Malaysia and I doubt our local film censorship board has anything they want to be censored. Second opinion: My girlfriend said that she finds it quite entertaining and that the monkey is the star of the show. Verdict: Surely, at least some of the general audience would find this franchise finale highly disappointing.